We accept MasterCard, Visa, Discover, personal local checks and cash. Tickets purchased using a credit card by phone are subject to a $2 handling fee per ticket. Student and Senior tickets are available for a $3 discount off the regular price for the three “main stage” productions. There is no student or senior discount available for our “Theater for Families” production. Only one discount may be applied per ticket. View directions to our theater here. Whether you are a professional travel planner, a group activities coordinator, or just a bunch of friends looking for a fun night out, we would love to help arrange for your group to see a show at HMT. Groups of 15 or more receive special rates. For more information, click here. 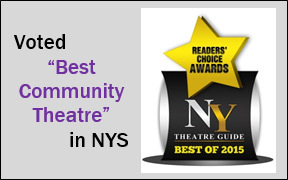 At HMT, we believe in the ability of theater to entertain, educate and enrich people’s lives. For that reason we are pleased to offer special student matinees. These weekday matinees will be open for school groups only, allowing students an opportunity to broaden their horizons by experiencing the magic of live theater. For more information about the school matinees, click here. Become a Season Subscriber – get your seats ahead of the general public and keep them all year! You get all three “main stage” shows (the December “Theater for Families” tickets may be purchased separately) for up to 20% off the individual ticket prices. For more information, click here.